April 14, 2016: Racing legend Mario Andretti rides around the paddock at the Toyota Grand Prix of Long Beach. Here’s the story and a flashback to go along with it. As I had mentioned in my previous post, I work dangerous close to the Grand Prix venue in Long Beach, CA. Preparations for the event begin around the end of February when concrete barricades are put into place. Little by little, day by day, the entire area around Shoreline Drive begins to take shape and it’s an amazing transformation to behold. Once things really started to get going, I began to take my lunchtime walks near the venue to check things out. For today’s walk, I was really unsure about how far I would be able to go now that they are starting to post temporary chain link fences around places that are normally open to the public. But I decided to take a chance and I wasn’t disappointed. While the fences were indeed up, most had an opening for local pedestrian traffic. The Indy cars started to arrive a few days ago so I thought I’d head down the the paddock to see what was going on, or at least what I could see with the limitations of security in place. There wasn’t a whole lot. Cars were still in trucks and toolboxes were still being rolled out in preparation for Friday’s first practice. So I took a few random shots and started heading back to work. As I was walking away, I noticed a man in the paddock sitting nonchalantly on a scooter. An assistant came over to him, shared a few words with the man, and they both laughed. 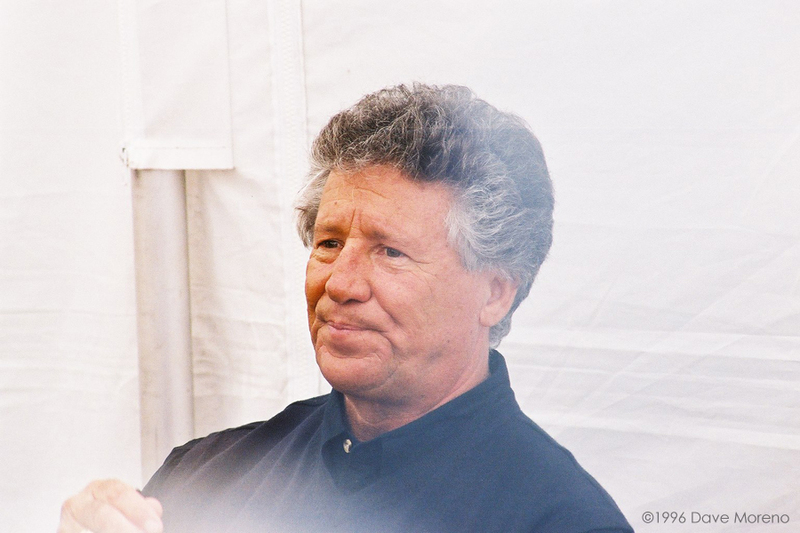 It was during that exchange that I realized I was looking at Mario Andretti, the four-time winner of the Toyota Grand Prix of Long Beach. The man, the legend. The name synonymous with speed. And here he is on a scooter. I had to capture this moment. I switched from my wide angle to zoom lens as he was starting up the presumably 50cc motorbike — I couldn’t imagine them needing anything bigger than that for their purpose. I switched just in time to see Andretti begin to slowly pull out. I focused and snapped a few shots and then a few more as he whizzed by, smiling and waving at me (although I missed his wave because I didn’t have the camera set to Burst). I gave him a thumbs-up and said, “Looking good, Mario!” after this shot as he made his way to the end of the paddock. What could have been a missed opportunity turned into an excellent photo op, and I’m glad I took that chance. He may have a few more wrinkles and gray hair but one thing is certain: whether Indy car or scooter, Mr. Andretti doesn’t play.